Epic recetly just released the stable version of Unreal Engine 4.22 which comes with real-time ray tracing and a fully fledged path tracer for ground truth images. It's fair to say that real-time photorealism on consumer graphics card has finally arrived. 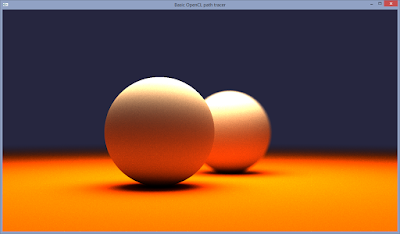 In the last few years, fast and performant path tracers have become available for free (e.g. Embree, OptiX, RadeonRays, Cycles) or virtually for free (e.g Arnold, Renderman). Thanks to advances in noise reduction algorithms, their rendering speed has been accelerated from multiple hours to a few seconds per frame. The rate at which game engines, with Unreal at the forefront, are taking over the offline-rendering world is staggering. Off-line rendering for architecture will most probably disappear in the near future and be replaced by game engines with real-time ray tracing features. The Blue Brain Project is a Swiss neuroscience research project based in Geneva which pushes the boundaries of computational neuroscience. It has an ambitious goal: to explore strange new worlds, to seek out new lifeforms and to boldly go where no man has gone before by simulating a complete digitally reconstructed biological brain using a supercomputer. We are currently looking for experienced fullstack React developers to help build a web application for real-time raytraced neuroscientific data (which is rendered on a remote cloud). Experience using the browser's dev tools for debugging, profiling, performance evaluation, etc. 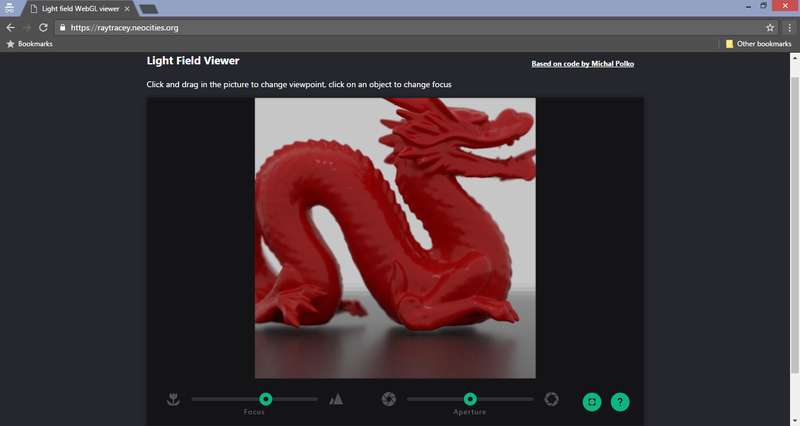 Nvidia recently released a new version of Optix, which finally adds support for the much hyped RTX cores on the Turing GPUs (RTX 2080, Quadro RTX 8000 etc), which provide hardware acceleration for ray-BVH and ray-triangle intersections. As a consequence, the Turing cards can render up to 10x faster in some scenes than the previous generation of Geforce cards, i.e. Pascal (GTX 1080), which is in fact two generations old if you take the Volta architecture into account (Volta was already a huge step up from Pascal in terms of rendering speed, so for Nvidia's sake it's better to compare Turing with Pascal). This post will be updated with more Optix benchmark numbers as they become available. The Blue Brain Project is a Swiss research project, based in Geneva, which started in 2005 and aims to faithfully simulate a detailed digital version of the mouse brain, (as close to biology as is possible with today's supercomputers). Visualising this simulated brain and its components is a massive challenge. Our goal is to build state-of-the-art visualisation tools to interactively explore extremely large and detailed scientific datasets (over 3 TB). The real-time visualisation is rendered remotely on a supercomputing cluster and can be interacted with on any client device (laptop, tablet or phone) via the web. To achieve interactive frame rates and high resolution, we are building our tools on top of the industry's highest performance ray tracing libraries (the Ospray library from Intel, which itself is based on Embree, and the OptiX framework for interactive GPU ray tracing from Nvidia). These libraries take advantage of the embarrassingly parallel nature of ray tracing and scale extremely efficiently across multiple cores, devices and nodes in a cluster. We are currently looking for software engineers to help accelerate the development of these tools, both in the frontend and backend. Our offices are located at the Campus Biotech in the international district in Geneva, Switzerland. Your responsibility will be to develop new features for our web based interactive 3D viewer "Brayns" (on the frontend) and maintain existing ones, and to drive the development of our new hub application where the scientists can manage their data visualisations. Experience using the browser dev tools for debugging, profiling, performance evaluation, etc. Experience in software development on supercomputers and distributed systems. "Specialized hardware for ray casting has been attempted in the past, but has been largely unsuccessful — partly because the shading and ray casting calculations are usually closely related and having them run on completely different hardware devices is not efficient. Having both processes running inside the same GPU is what makes the RTX architecture interesting. 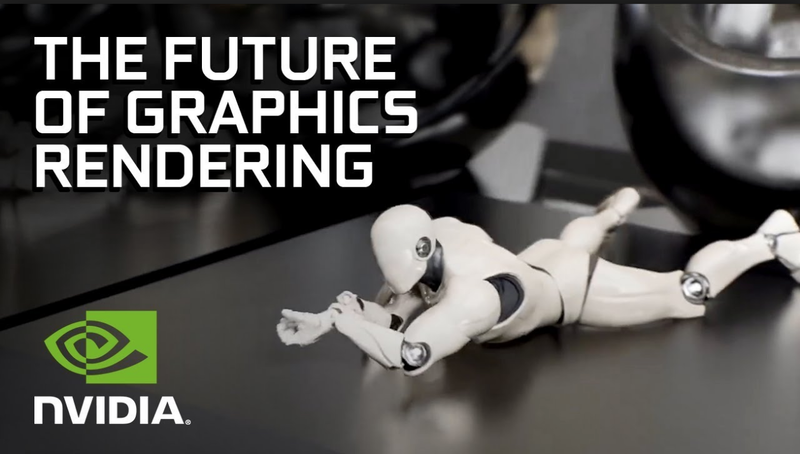 We expect that in the coming years the RTX series of GPUs will have a large impact on rendering and will firmly establish GPU ray tracing as a technique for producing computer generated images both for off-line and real-time rendering." Chaos Group have always been a frontrunner in real-time photorealistic ray tracing research on GPUs, even as far back as Siggraph 2009 where they showed off the first version of V-Ray RT GPU rendering on CUDA (see http://raytracey.blogspot.com/2009/08/race-for-real-time-ray-tracing.html or https://www.youtube.com/watch?v=DJLCpS107jg). I have to admit that I'm both stoked, but also a bit jealous when I see what Chaos Group has achieved with project Lavina, as it is exactly what I hoped Brigade would turn into one day (Brigade was a premature real-time path tracing engine developed by Jacco Bikker in 2010, which I experimented with and blogged about quite extensively, see e.g. http://raytracey.blogspot.com/2012/09/real-time-path-tracing-racing-game.html ). 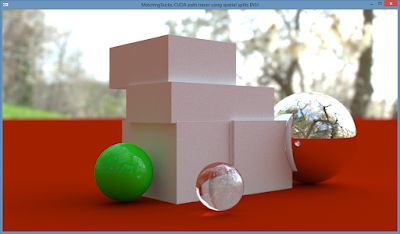 Then again, thanks to noob-friendly ray tracing API's like Nvidia's RTX and Optix, soon everyone's grandmother and their dog will be able to write a real-time path tracer, so all is well in the end. This is just mindblowing stuff. Can't wait to get my hands on it. This probably deserves its own blogpost. Before continuing the tutorial series, let's have a look at a simple but effective way to speed up path tracing. The idea is quite simple: like an octree, a bounding volume hierarchy (BVH) can double as both a ray tracing acceleration structure and a way to represent the scene geometry at multiple levels of detail (multi-resolution geometry representation). Specifically the axis-aligned bounding boxes (AABB) of the BVH nodes at different depths in the tree serve as a more or less crude approximation of the geometry. 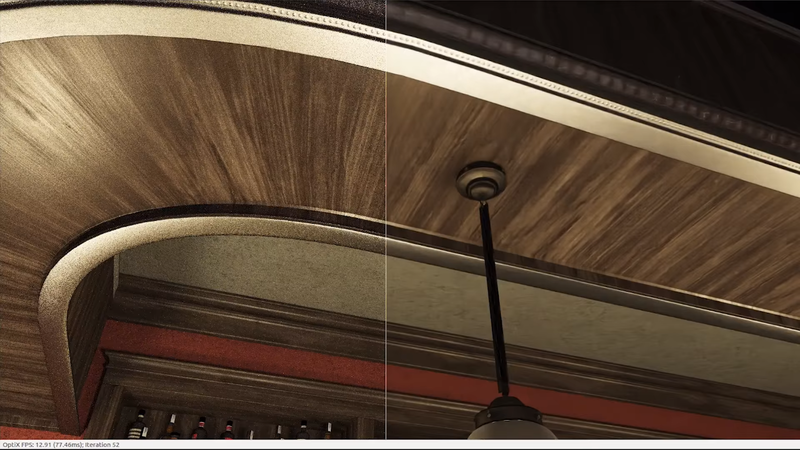 Low detail geometry enables much faster ray intersections and can be useful when light effects don't require full geometric accuracy, for example in the case of motion blur, glossy (blurry) reflections, soft shadows, ambient occlusion and global illumination with diffuse bounced lighting. Especially when geometry is not directly visible in the view frustum or in specular (mirror-like) reflections, using geometry proxies can provide a significant speedup (depending on the fault tolerance) at an almost imperceptible and negligible loss in quality. Normals are axis aligned, but can be precomputed per AABB vertex (and stored at low precision) by averaging the normals of the AABBs it contains, with the leafnodes averaging the normals of their triangles. The Blue Brain Project is a Switzerland based computational neuroscience project which aims to demystify how the brain works by simulating a biologically accurate brain using a state-of-the-art supercomputer. The simulation runs at multiple scales and goes from the whole brain level down to the tiny molecules which transport signals from one cell to another (neurotransmitters). The knowledge gathered from such an ultra-detailed simulation can be applied to advance neuroengineering and medical fields. To visualize these detailed brain simulations, we have been working on a high performance rendering engine, aptly named "Brayns". Brayns uses raytracing to render massively complex scenes comprised of trillions of molecules interacting in real-time on a supercomputer. The core ray tracing intersection kernels in Brayns are based on Intel's Embree and Ospray high performance ray tracing libraries, which are optimised to render on recent Intel CPUs (such as the Skylake architecture). These CPUs basically are a GPU in CPU disguise (as they are based on Intel's defunct Larrabee GPU project), but can render massive scientific scenes in real-time as they can address over a terabyte of RAM. What makes these CPUs ultrafast at ray tracing is a neat feature called AVX-512 extensions, which can run several ray tracing calculations in parallel (in combination with ispc), resulting in blazingly fast CPU ray tracing performance which rivals that of a GPU and even beats it when the scene becomes very complex. 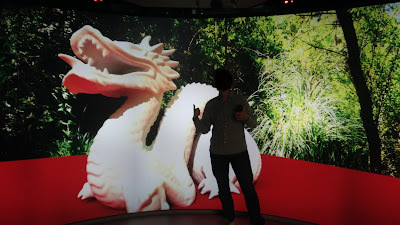 Seeing this scene projected lifesize in photorealistic detail on a 180 degree stereoscopic 3D screen and interacting with it in real-time is quite a breathtaking experience. Having 3D molecules zooming past the observer will be the next milestone. I haven't felt this thrilled about path tracing in quite some time. 2018 will be bookmarked as a turning point for Monte Carlo rendering due to the wide availability of fast, high quality denoising algorithms, which can be attributed for a large part to Nvidia Research: Nvidia just released OptiX 5.0 to developers, which contains a new GPU accelerated "AI denoiser" which works as post-processing filter. In contrast to traditional denoising filters, this new denoiser was trained using machine learning on a database of thousands of rendered image pairs (using both the noisy and noise-free renders of the same scene) providing the denoiser with a "memory": instead of calculating the reconstructed image from scratch (as a regular noise filter would do), it "remembers" the solution from having encountered similar looking noisy input scenes during the machine learning phase and makes a best guess, which is often very close to the converged image but incorrect (although the guesses progressively get better as the image refines and more data is available). By looking up the solution in its memory, the AI denoiser thus bypasses most of the costly calculations needed for reconstructing the image and works pretty much in real-time as a result. The OptiX 5.0 SDK contains a sample program of a simple path tracer with the denoiser running on top (as a post-process). The results are nothing short of stunning: noise disappears completely, even difficult indirectly lit surfaces like refractive (glass) objects and shadowy areas clear up remarkably fast and the image progressively get closer to the ground truth. The denoiser is provided free for commercial use (royalty-free), but requires an Nvidia GPU. It works with both CPU and GPU rendering engines and is already implemented in Iray (Nvidia's own GPU renderer), V-Ray (by Chaos Group), Redshift Render and Clarisse (a CPU based renderer for VFX by Isotropix). Other renderers like Cycles and Corona already have their own built-in denoisers, but will probably benefit from the OptiX denoiser as well (especially Corona which was acquired by Chaos Group in September 2017). 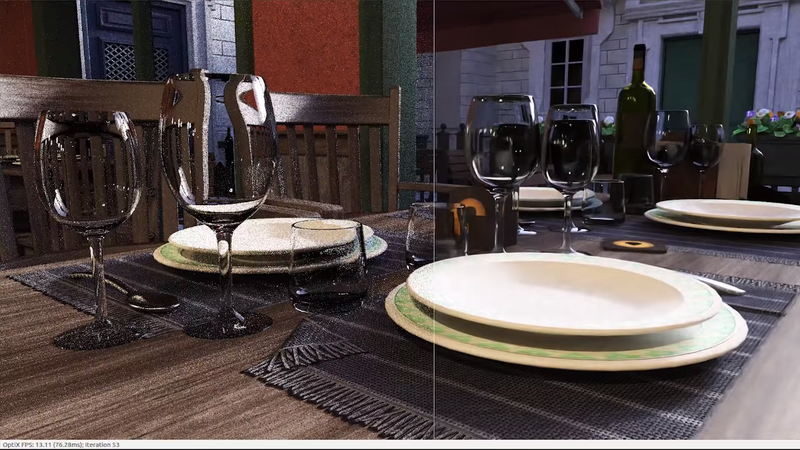 The OptiX team has indicated that they are researching an optimised version of this filter for use in interactive to real-time photorealistic rendering, which might find its way into game engines. Real-time noise-free photorealistic rendering is tantalisingly close. We propose a hybrid ray-tracing/rasterization strategy for realtime rendering enabled by a fast new denoising method. We factor global illumination into direct light at rasterized primary surfaces and two indirect lighting terms, each estimated with one pathtraced sample per pixel. Our factorization enables efficient (biased) reconstruction by denoising light without blurring materials. We demonstrate denoising in under 10 ms per 1280×720 frame, compare results against the leading offline denoising methods, and include a supplement with source code, video, and data. While the premise of the paper sounds incredibly exciting, the results are disappointing. The denoising filter does a great job filtering almost all the noise (apart from some noise which is still visible in reflections), but at the same it kills pretty much all the realism that path tracing is famous for, producing flat and lifeless images. Even the first Crysis from 10 years ago (the first game with SSAO) looks distinctly better. I don't think applying such aggressive filtering algorithms to a path tracer will convince game developers to make the switch to path traced rendering anytime soon. A comparison with ground truth reference images (rendered to 5000 samples or more) is also lacking from some reason. 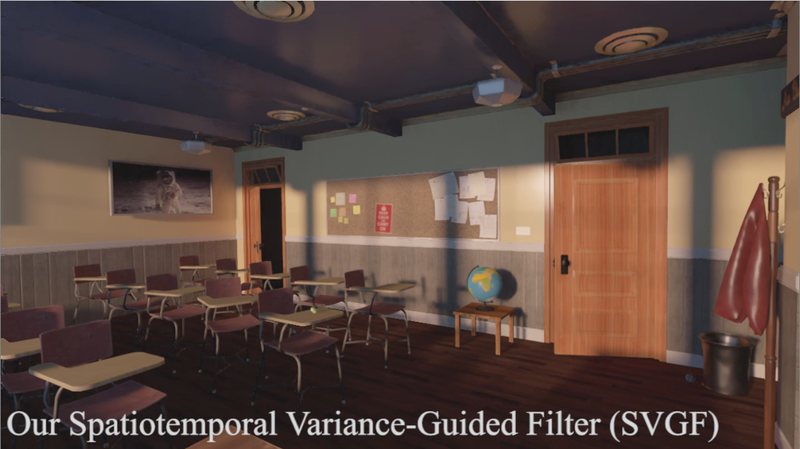 At the same conference, a very similar paper will be presented titled "Spatiotemporal Variance-Guided Filtering: Real-Time Reconstruction for Path-Traced Global Illumination". We introduce a reconstruction algorithm that generates a temporally stable sequence of images from one path-per-pixel global illumination. To handle such noisy input, we use temporal accumulation to increase the effective sample count and spatiotemporal luminance variance estimates to drive a hierarchical, image-space wavelet filter. This hierarchy allows us to distinguish between noise and detail at multiple scales using luminance variance. 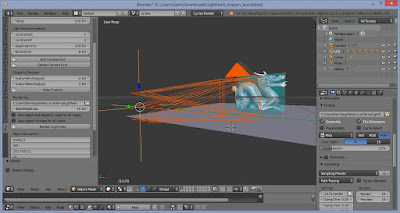 Physically-based light transport is a longstanding goal for real-time computer graphics. While modern games use limited forms of ray tracing, physically-based Monte Carlo global illumination does not meet their 30 Hz minimal performance requirement. Looking ahead to fully dynamic, real-time path tracing, we expect this to only be feasible using a small number of paths per pixel. 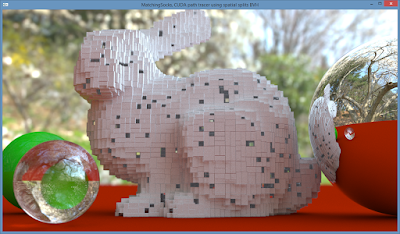 As such, image reconstruction using low sample counts is key to bringing path tracing to real-time. When compared to prior interactive reconstruction filters, our work gives approximately 10x more temporally stable results, matched references images 5-47% better (according to SSIM), and runs in just 10 ms (+/- 15%) on modern graphics hardware at 1920x1080 resolution. It's going to be interesting to see if the method in this paper produces more convincing results that the other paper. Either way HPG has a bunch more interesting papers which are worth keeping an eye on. UPDATE (16 July): Christoph Schied from Nvidia and KIT, emailed me a link to the paper's preprint and video at http://cg.ivd.kit.edu/svgf.php Thanks Christoph! I'm not convinced by the quality of filtered path traced rendering at 1 sample per pixel, but perhaps the improvements in spatiotemporal stability of this noise filter can be quite helpful for filtering animated sequences at higher sample rates. UPDATE (23 July) There is another denoising paper out from Nvidia: "Interactive Reconstruction of Monte Carlo Image Sequences using a Recurrent Denoising Autoencoder" which uses machine learning to reconstruct the image. We describe a machine learning technique for reconstructing image se- quences rendered using Monte Carlo methods. Our primary focus is on reconstruction of global illumination with extremely low sampling budgets at interactive rates. Motivated by recent advances in image restoration with deep convolutional networks, we propose a variant of these networks better suited to the class of noise present in Monte Carlo rendering. We allow for much larger pixel neighborhoods to be taken into account, while also improving execution speed by an order of magnitude. Our primary contri- bution is the addition of recurrent connections to the network in order to drastically improve temporal stability for sequences of sparsely sampled input images. Our method also has the desirable property of automatically modeling relationships based on auxiliary per-pixel input channels, such as depth and normals. We show signi cantly higher quality results compared to existing methods that run at comparable speeds, and furthermore argue a clear path for making our method run at realtime rates in the near future. 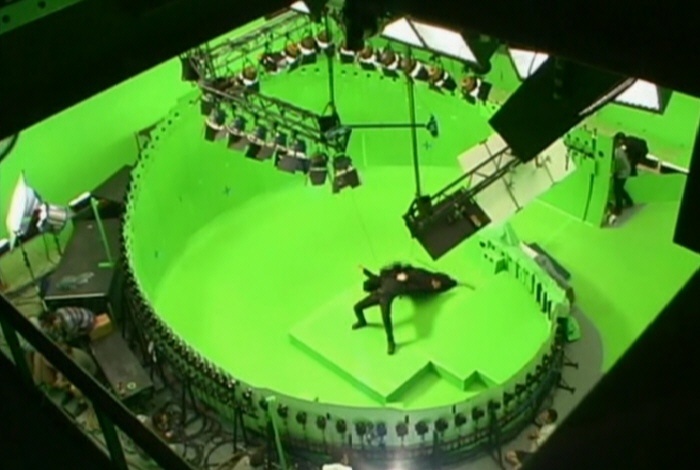 The technology captures all light rays in a scene by pre-rendering it from many different viewpoints. 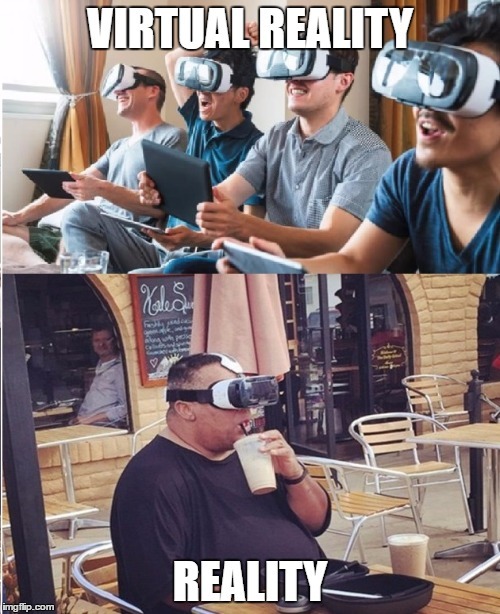 During runtime, entirely new viewpoints are created by interpolating those viewpoints on-the-fly resulting in photoreal reflections and lighting in real-time (http://www.roadtovr.com/googles-seurat-surface-light-field-tech-graphical-breakthrough-mobile-vr/). This plug-in sets up a camera grid in Blender and renders the scene from each camera using the Cycles path tracing engine. Good results can be obtained with a grid of 17 by 17 cameras with a distance of 10 cm between neighbouring cameras. For high quality, a 33-by-33 camera grid with an inter-camera distance of 5 cm is recommended. 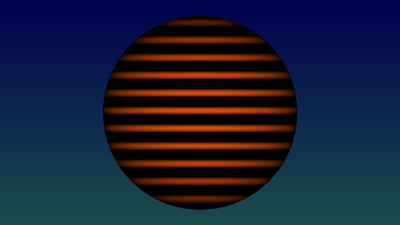 2) The second tool is the light field encoder and WebGL based light field viewer, created by Michal Polko, found at https://github.com/mpk/lightfield (build instructions are included in the readme file). This plugin takes in all the images generated by the first plug-in and compresses them by keeping some keyframes and encoding the delta in the remaining intermediary frames. The viewer is WebGL based and makes use of virtual texturing (similar to Carmack's mega-textures) for fast, on-the-fly reconstruction of new viewpoints from pre-rendered viewpoints (via hardware accelerated bilinear interpolation on the GPU). You can change the viewpoint (within the limits of the original camera grid) and refocus the image in real-time by clicking on the image. I rendered the Stanford dragon using a 17 by 17 camera grid and distance of 5 cm between adjacent cameras. The light field was created by rendering the scene from 289 (17x17) different camera viewpoints, which took about 6 minutes in total (about 1 to 2 seconds rendertime per 512x512 image on a good GPU). The 289 renders are then highly compressed (for this scene, the 107 MB large batch of 289 images was compressed down to only 3 MB!). A later tutorial will add a bit more freedom to the camera, allowing for rotation and zooming.  Thanks to Erich Loftis and Brandon Miles for useful tips on improving the generation of random numbers in OpenCL to avoid the distracting artefacts (showing up as a sawtooth pattern) when using defocus blur (still not perfect but much better than before). The next tutorial will cover rendering of triangles and triangle meshes. I'm working for an international company with very large (<Trump voice>"YUUUUUGE"<\Trump voice>) industry partners. We are currently looking for excellent developers with experience in GPU rendering (path tracing) for a new project. and a strong interest in physically based rendering and ray tracing. The host (CPU) sets up the OpenCL environment and launches the OpenCL kernel which will be executed on the OpenCL device (GPU or CPU) in parallel. Each work item (or thread) on the device will calculate one pixel of the image. There will thus be as many work items in the global pool as there are pixels in the image. Each work item has a unique ID which distinguishes from all other work items in the global pool of threads and which is obtained with get_global_id(0). Now let's use the OpenCL device for some ray tracing. 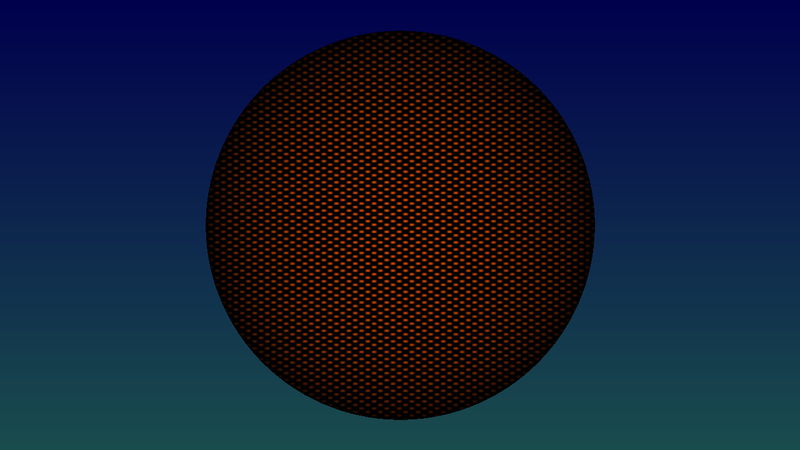 Rays are shot from the camera (which is in a fixed position for this tutorial) through an imaginary grid of pixels into the scene, where they intersect with 3D objects (in this case spheres). For each pixel in the image, we will generate one camera ray (also called primary rays, view rays or eye rays) and follow or trace it into the scene. 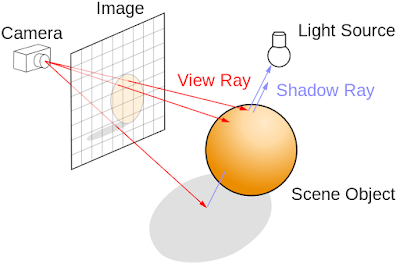 For camera rays, the ray origin is the camera position and the ray direction is the vector connecting the camera and the pixel on the screen. yields solutions for t (the distance to the point where the ray intersects the sphere) given by the quadratic formula −b ± √ b2 − 4ac / 2a (where b2 - 4ac is called the discriminant). Depending on whether the determinant is negative, zero or positive, there can be zero (ray misses sphere), one (ray just touches the sphere at one point) or two solutions (ray fully intersects the sphere at two points) respectively. The distance t can be positive (intersection in front of ray origin) or negative (intersection behind ray origin). The details of the mathematical derivation are explained in this Scratch-a-Pixel article. The ray-sphere intersection algorithm is optimised by omitting the "a" coefficient in the quadratic formula, because its value is the dot product of the normalised ray direction with itself which equals 1. Taking the square root of the discriminant (an expensive function) can only be performed when the discriminant is non-negative. 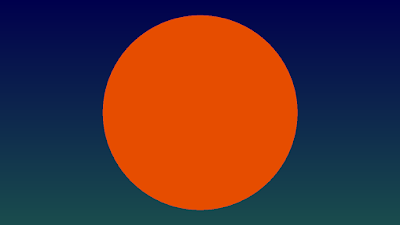 For simplicity, in this first part of the tutorial the scene will be initialised on the device in the kernel function (in the second part the scene will be initialised on the host and passed to OpenCL which is more flexible and memory efficient, but also requires to be more careful with regards to memory alignment and the use of memory address spaces). Every work item will thus have a local copy of the scene (in this case one sphere). 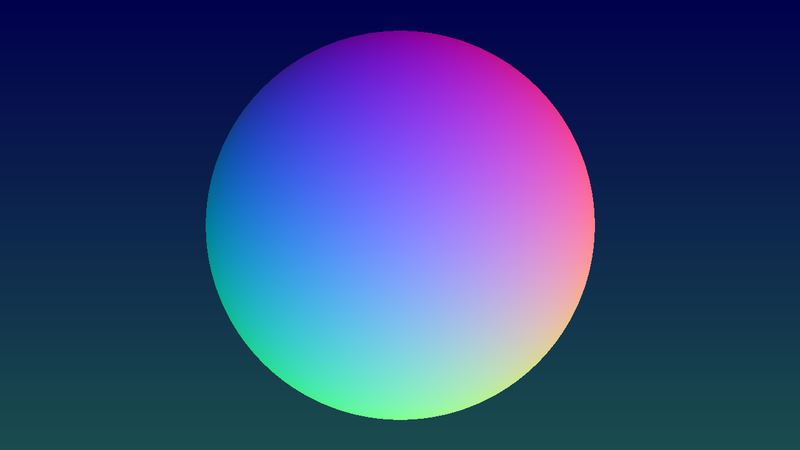 A more interesting sphere with cosine-weighted colours, giving the impression of front lighting. To achieve this effect we need to calculate the angle between the ray hitting the sphere surface and the normal at that point. 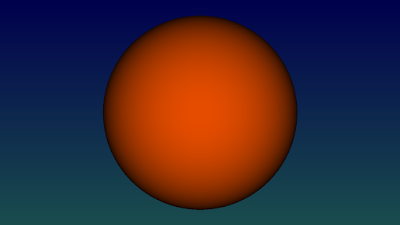 The sphere normal at a specific intersection point on the surface is just the normalised vector (with unit length) going from the sphere center to that intersection point. The executable demo will render the above images. 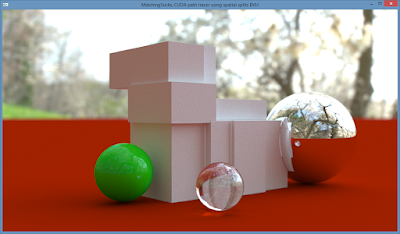 The following section covers the background of the ray tracing process in a very simplified way, but should be sufficient to understand the code in this tutorial. Scratch-a-Pixel provides a much more detailed explanation of ray tracing. Ray tracing is a general term that encompasses ray casting, Whitted ray tracing, distribution ray tracing and path tracing. So far, we have only traced rays from the camera (so called "camera rays", "eye rays" or "primary rays") into the scene, a process called ray casting, resulting in plainly coloured images with no lighting. In order to achieve effects like shadows and reflections, new rays must be generated at the points where the camera rays intersect with the scene. These secondary rays can be shadow rays, reflection rays, transmission rays (for refractions), ambient occlusion rays or diffuse interreflection rays (for indirect lighting/global illumination). For example, shadow rays used for direct lighting are generated to point directly towards a light source while reflection rays are pointed in (or near) the direction of the reflection vector. For now we will skip direct lighting to generate shadows and go straight to path tracing, which is strangely enough easier to code, creates more realistic and prettier pictures and is just more fun. 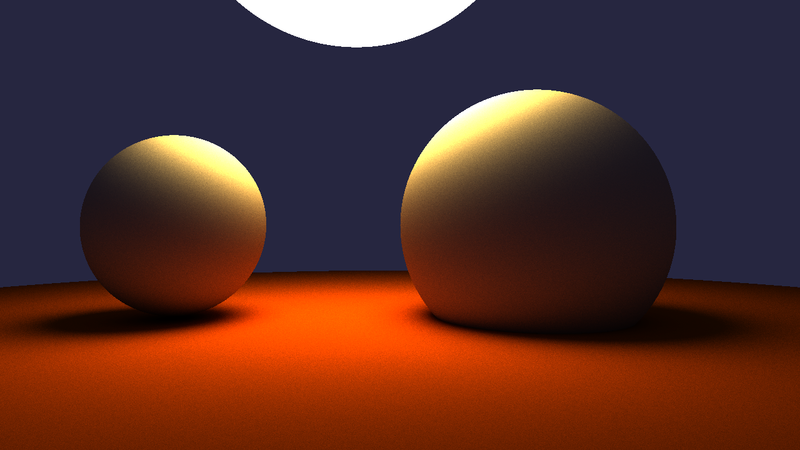 In (plain) path tracing, rays are shot from the camera and bounce off the surface of scene objects in a random direction (like a high-energy bouncing ball), forming a chain of random rays connected together into a path. If the path hits a light emitting object such as a light source, it will return a colour which depends on the surface colours of all the objects encountered so far along the path, the colour of the light emitters, the angles at which the path hit a surface and the angles at which the path bounced off a surface. These ideas form the essence of the "rendering equation", proposed in a paper with the same name by Jim Kajiya in 1986. Since the directions of the rays in a path are generated randomly, some paths will hit a light source while others won't, resulting in noise ("variance" in statistics due to random sampling).  The noise can be reduced by shooting many random paths per pixel (= taking many samples) and averaging the results. - the scene is initialised on the host (CPU) side, which requires a host version of the Sphere struct. Correct memory alignment in the host struct is very important to avoid shifting of values and wrongly initialised variables in the OpenCL struct, especially when using OpenCL's built-in data types such as float3 and float4. If necessary, the struct should be padded with dummy variables to ensure memory alignment (the total size of the struct must be a multiple of the size of float4). - explicit memory management: once the scene is on the device, its pointer can be passed on to other device functions preceded by the keyword "__global" or "__constant". 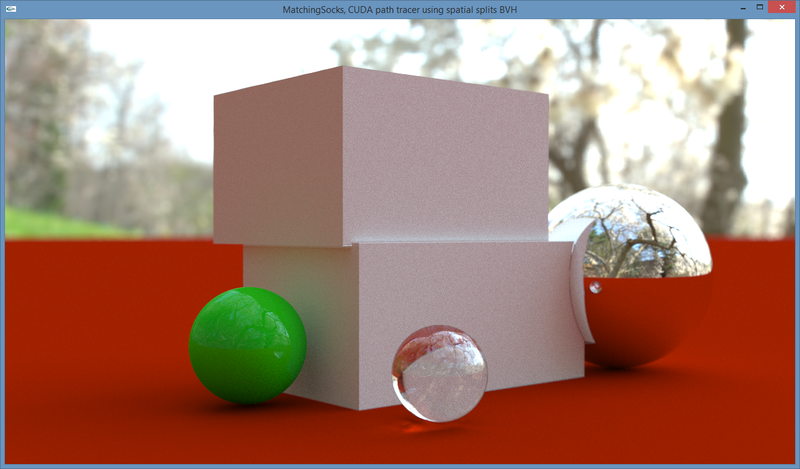 - iterative path tracing function: since OpenCL does not support recursion, the trace() function traces paths iteratively (instead of recursively) using a loop with a fixed number of bounces (iterations), representing path depth. - each path starts off with an "accumulated colour" initialised to black and a "mask colour" initialised to pure white. The mask colour "collects" surface colours along its path by multiplication. The accumulated colour accumulates light from emitters along its path by adding emitted colours multiplied by the mask colour. - cosine-weighted importance sampling: because diffuse light reflection is not truly uniform, the light contribution from rays that are pointing away from the surface plane and closer to the surface normal is greater. Cosine-weighted importance sampling favours rays that are pointing away from the surface plane by multiplying their colour with the cosine of the angle between the surface normal and the ray direction. 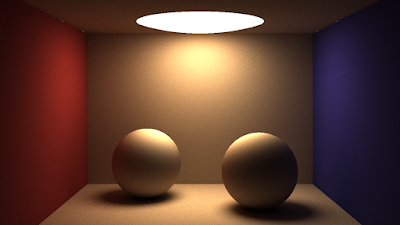 - while ray tracing can get away with tracing only one ray per pixel to render a good image (more are needed for anti-aliasing and blurry effects like depth-of-field and glossy reflections), the inherently noisy nature of path tracing requires tracing of many paths per pixel (samples per pixel) and averaging the results to reduce noise to an acceptable level. A screenshot made with the code above (also see the screenshot at the top of this post). Notice the colour bleeding (bounced colour reflected from the floor onto the spheres), soft shadows and lighting coming from the background. 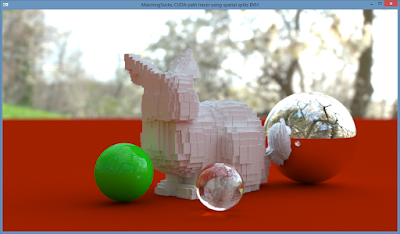 - Scratch-a-pixel is an excellent free online resource to learn about the theory behind ray tracing and path tracing. Many code samples (in C++) are also provided. This article gives a great introduction to global illumination and path tracing. 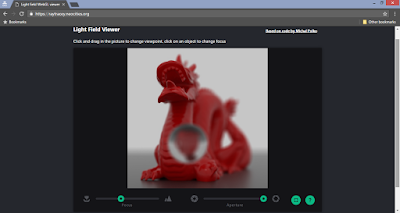 The next tutorial will cover the implementation of an interactive OpenGL viewport with a progressively refining image and an interactive camera with anti-aliasing and depth-of-field.